(Excerpt from Goodreads) Rock shop owner Morgan Iverson’s discovery of human remains reopens a cold case and unhealed wounds in a Colorado mountain town, while her find of a rare gemstone sparks a dangerous treasure hunt. Fifteen years ago, prom queen Carlee Kruger vanished. When Carlee’s mother asks Morgan to investigate her death, the clues seem as convoluted as the coils on a fossilized ammonite. The local newspaper editor joins the hunt to uncover the past, while the rock shop’s mascot donkeys and an elderly cowboy chase after a Sasquatch look-alike. Whoever knows what happened to Carlee will do anything to keep the truth buried. While on a field trip to learn more about geology, Morgan stumbles upon a skeleton guarded by a strange Mountain Man. This body leads to a cold case two years ago when a high school girl, Carlee disappears. Morgan is asked to look into Carlee’s murder by her mother. But this is not the only strange things going on. There is also a hunt for Sasquatch and a Mountain Man terrorizing the town. It also seems that those that have a connection to Carlee’s disappearance are finding themselves in perilous situations. I really like cozy mysteries and Stone Cold Case is no exception. Morgan is a great lead character that you can’t help but like and you can’t help but like her after her brother dumps the rock shop on her and leaves the country. I loved Golden Springs. It’s a small town with the usual small town crowd and politics. The story was great, there were a lot of things going on so I was a little lost at the beginning but it all came together beautifully at the end. I have to say that the touch of romance added to the story. Although this is the second book in the series, you can easily read it as a stand-alone. If you like mysteries, look no further. The Rock Shop Mystery series is one that you have to check out. 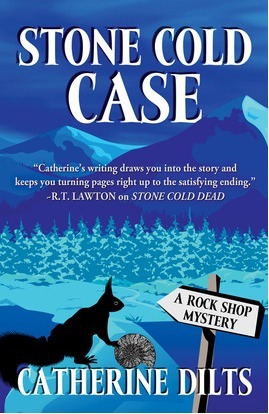 To purchase Stone Cold Case, or for more information on the Rock Shop Mystery series, make sure to check out Amazon, Barnes and Noble, Goodreads, and Catherine Dilt’s website.